Karva Chauth became a buzz word on Twitter leaving most of the members clueless. Times of India states while the North Indian females were busy preparing for the festival, it was fun to see the rest of the world's reaction to Karva Chauth. There were curious queries from clueless people. The other site claims to have discussed all the details of this auspicious occasion. The only point it missed was the reason behind it. Anyway, I am not interested in the media reports (for the first time) because I have my own story to share. After watching Mom observing fast on Karva Chauth for years and the numerous scenes in movies, it was finally my chance to be a part of it. Keeping the fast, getting all decked up, preparing delicacies, performing the Puja, waiting for the moon, the chhalni (sieve) part and finally... eating :) It was my turn to feel the excitement as well as hunger and thirst; the former being more prominent and dominant. 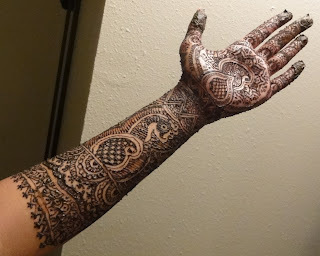 The preparations started a couple of days in advance especially with the Mehendi/Henna application. After doing it for a friend of mine, it was my turn. 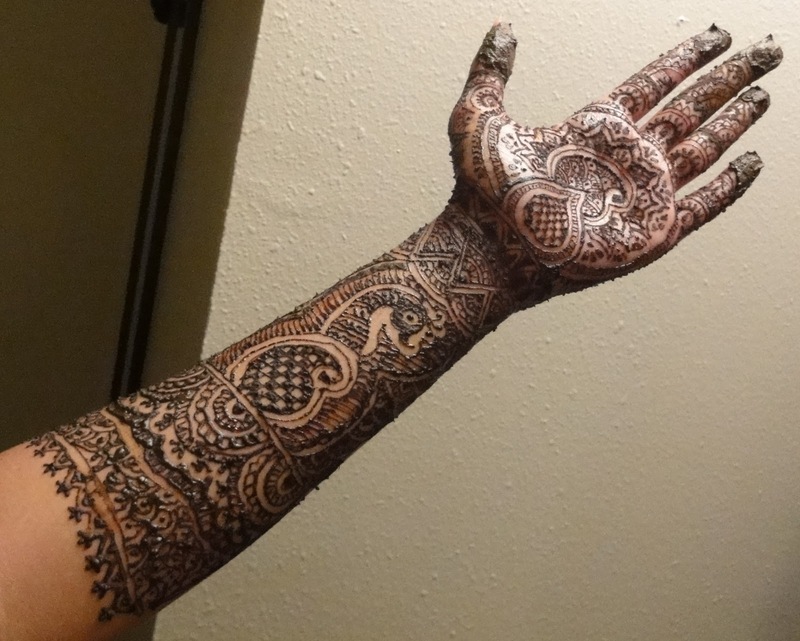 I knew that it would be difficult to put it on my right hand but I started off with the Henna cone in my left hand. This is what the design on my right hand looked like. After seeing this, the right hand knew that it would have to put up a brilliant show to save some grace. The poor fellow thought and thought and thought and decided to cover the entire forearm to show his talent. The following is the picture of right hand's efforts. Help me to decide which one is better!! The best was reserved for the last... the Puja. I have no idea why the females are supposed to see the moon and the husband's face though a sieve but to tell you the truth, I really liked it :) It was filmy indeed but a pleasure!! About the fast... it is not difficult at all. Though, we got a bit restless during the last one hour with food waiting on the table and clouds hiding the moon, the rest of the day was pretty good. A note for all those who fast with their wives... Kudos guys!! and for those who don't... try it once, your wife would be a lot happier, trust me!! P.S.-The driving force was only and only OUR love!! tumhari right hand ki mehandi dekh ke lag nahi raha ki tumne pehli baar left hand se lagayi hai..
it would have been a great feeling..
Thanx for the DP that helped me judge this time..
After magnifying ur DP 300 times i can say undoubtedly, ur left hand work is better than right. P.S. : You could have post the pic in blog itself, what was the need to make it as ur profile pic?